Joining the line-up of ¾ helmets for 2017, the Bell Riot Helmet is a perfect marriage between vintage style and modern functionality. This year seems to be big for Bell’s open-faced and ¾ helmets, and the Bell Riot and Riot Checks helmet are part of the new wave of retro-inspired lids. Constructed with a composite shell, the Riot helmet comes in 5 shell and EPS liner sizes to give riders the best fit to achieve the sleek, low profile look. The easy-to-change faceshield mechanism and NutraFog shield add a modern edge to the classic looks of the Riot helmet, providing riders with the best of both worlds. The Bell Riot Helmet’s wind-and-weather tight gasket seal ensures protection from the elements in the unfortunate case of riding through some inclement weather. 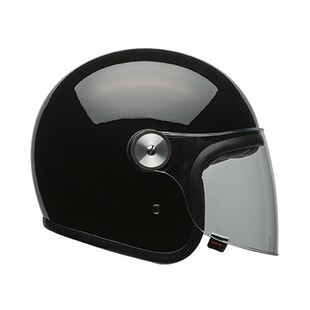 If the simplicity of a solid helmet isn’t your style, the Bell Riot Checks helmet achieves the same vibe as its brother, but with a more retro-racer vibe. Though it may be a more subtle color-scheme than other graphic helmets in Bell’s 2017 line-up, it’s still designed in classic Bell fashion. 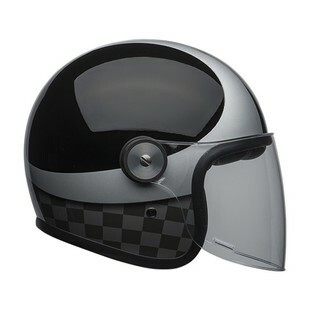 With its bold colors, the checkerboard lining, and thick silver stripes that are reminiscent of the Custom 500 Chemical Candy, the Riot Checks helmet is unmistakably a Bell construction. This season sees Bell really addressing some of the key issues that riders using ¾ helmets might have, while also providing them with more fun, creative colorways beyond the traditional solid colored, open-faced helmet.